Restoring this grand house was the opportunity of a lifetime. Let Tim and Sarah Hopkins' sensitive renovation of their Grade II listed home inspire you to embark on your own project. So handsome is the facade of this impressive Jacobean hunting lodge, nestled deep in the Worcestershire countryside, that Tim Hopkins just had to knock on the door when he passed it by chance one afternoon. Although he discovered that it was not for sale, the lady of the house held on to his details and, two years later, he received a phone call inviting him to come and see it again before she put it on the market. At the time, the Hopkins family had spent the previous 15 happy years living in a much smaller 1930s property set in an arboretum. Nevertheless, Tim managed to convince his wife Sarah to go and take a look at the house he had dreamt of owning. They found, however, that it was far from a dream home inside. ‘It was a warren of tiny rooms,’ recalls Tim; ‘it was dark, cold and very unwelcoming.’ Yet undeterred, they could also see that, with careful and extensive restoration work, it could be transformed. ‘It just needed a lot of imagination,’ adds Sarah. Amongst the wealthy and notable names that had previously occupied the house throughout its history were the Earl of Dudley, ‘who did a Georgian makeover on the place’, says Tim, and the Brinton family (of Brintons Carpets), who lived in the house for some 200 years. Yet in more recent times the house had fallen into disrepair. The decay was so extensive that they had to employ local stonemason Mark Hamblin and his son Josh to work on the exterior of the red sandstone building, which alone took three years. ‘We started with the structure,’ explains Tim, ‘as I was so keen that the integrity of the house was right. While the stonemasonry was done, we sorted out the windows, which were a mix of the original mullioned style and later Georgian additions.’ They found though that every window they thought could be repaired ‘fell apart. In fact, everything we touched fell apart!’ Tim adds, laughing, ‘because the house had been untouched for such a long time.’ The couple were, however, relieved to discover that the roof had been worked on by the previous owners. The scale of the house too proved a challenge. Tim and Sarah discovered that the logistics of getting basic amenities, such as an industrial supply of electricity to the house – which today has more than 200 low wattage LED spotlights alone – along with adequate water pressure on the top floor, was far from straightforward. The property was also heavily insulated and fitted with discreet solar panels to create a warm family home. They then turned their thoughts to opening up the tiny warren of rooms that carved up the house, and employed Darron Woore as project manager and interior designer. ‘Together we looked at how the house would have originally worked and aesthetically looked, then adapted some rooms for how we wanted to live in them today,’ says Tim. Tim was keen to preserve any original features, such as ‘the hall ceiling that came off a galleon from the 1500s, the original oak floorboards and some of the fireplaces.’ The Jacobean ceiling in the master bedroom, made from horsehair and plaster, was carefully restored and layers of garish green, gold and red paint removed before it was lined with a thick heritage paper and repainted. A painting of the house commissioned by the Earl of Dudley, which hangs in the hall, was also restored by specialist painter Steve Hawthorn, who made a new frame for it from cornice decorated in gold leaf. Elsewhere, where features had been removed or lost, Darron had them recreated. He also added new panelling, which was distressed to make it appear part of the house’s Georgian makeover. This adds interest, atmosphere and makes the space feel more intimate. To create the light, contemporary look that Sarah craved and to help the rooms to flow, they agreed on a soft palette throughout, with luxurious finishes. To complete the scheme, Darron then combined the family’s treasured antiques with other pieces made up by his team, where very large-scale antiques would have been impossible to source, or outrageously expensive to buy. At Christmas, everyone pitches in with jobs around the house. 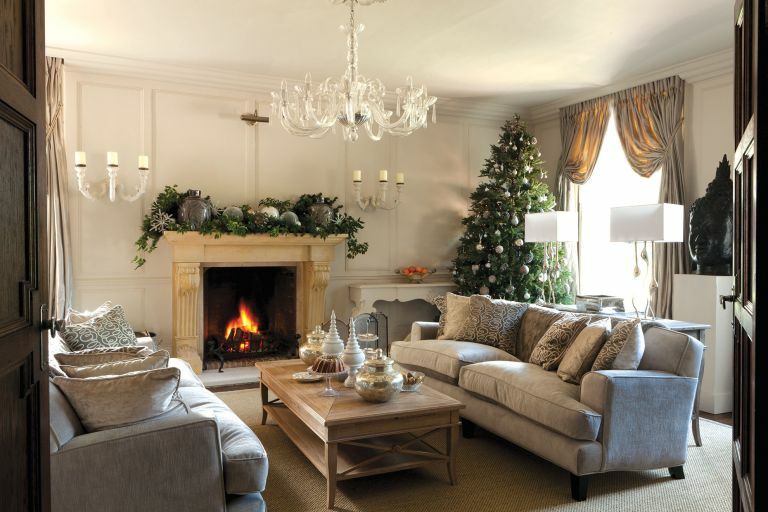 ‘Harry collects the kindling and sets the fires, someone else will keep them going, Aimee looks aft er the animals, Sarah makes sure everything is in order for entertaining, and I do the cooking,’ says Tim, the host of this beautiful home which is now fit for a grand celebration.